ABC has released the trailer for Zach Braff comedy Alex, Inc., which follows a father of two as he starts a new business. ABC has released the trailer for new comedy Alex, Inc. and in it, we see that the motivation to chase your dreams can come from the most unexpected of sources. From Matt Tarses (Scrubs), Alex, Inc. follows radio journalist Alex Schuman (Zach Braff), who finds himself at a career crossroads. After growing frustrated with how he’s being treated by the radio show he’s worked on for 16 years, Alex decides to quit his job and start a podcast company to tell the type of stories that he wants, not the type of stories that exist simply to pander to listeners. He wants to tell engaging, thought-provoking stories that give him the sense of fulfillment he felt when he first got into radio, but starting a small business on your own is difficult, especially when you’re used to a steady, sizable income. Alex will have to assemble the right team and hope for a little bit of luck if he’s to support his family while in the process living his dream. 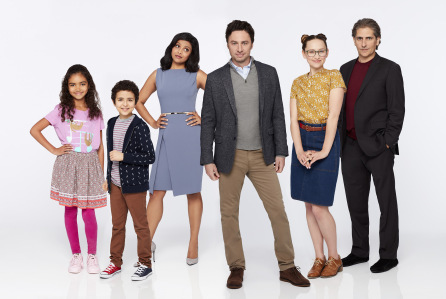 In addition to Braff, Alex, Inc. stars Tiya Sircar (The Good Place), Hillary Anne Matthews (Single by 30), Michael Imperioli (The Sopranos), Elisha Henig (Lab Rats: Elite Force), and newcomer Audyssie James. Alex, Inc. is set to air midseason on ABC. You can check out the network’s full fall schedule here. Will you be watching? Do you think a show about someone starting a podcast will be relatable to Middle America? Would you like to see more shows of this vein on television?